Blush or blusher is useful to give color and warmth to the face. The view that most women want to achieve is a fresh face radiant, warm and natural, Blush is available in powder, cream or liquid and in a variety of colors. How to put blush on liquid and cream blush on the right is to use it as a face before being given a foundation and powder. Blush would look more perfect if we do not face problems. Blush on this type is very sensitive to skin problems. 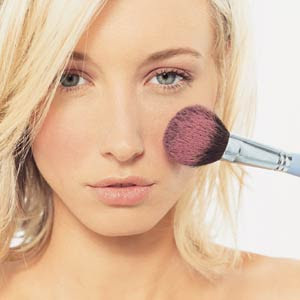 Blush is more suitable for dry and normal skin. Generally, most women prefer to use a powder blush / powder because it's easier to wear, This type can be used for all skin types, especially for oily skin because it will reduce the oil available for use. Solid, blush is only used when we have to use foundation and powder. How to put blush on is to sweep blush downward from the ear to mid-cheek, beginning the equivalent of the top of the ear and ends at the end of your cheekbones. If you want to perform optimally, know how to put on a good blush for your face shape so you can get around the shape of your face. Color blush is best to choose colors that are close to your skin tone. Be sure to do the blush test. Once you are done with all the makeup, backwards, look in the mirror. Check to see if your face 'balanced'. You should have enough blush to make you look as though you flushed. When you look too much, then cut back on your blush. To soften blush on, put a little powder over your blush. In the evening you can wear blush a little more fit the look you want to achieve.